The Soundplane Model A is a computer music controller with the sensitivity and feel of an acoustic instrument. It detects a wide range of touches on its walnut playing surface, from a light tickle to a very firm press. Unlike a MIDI keyboard, which typically sends out just one velocity value at the start of a note, the Soundplane communicates three dimensions of information, x, y and pressure, over the entire duration of every touch. As a synthesist, this lets you replace a triggered envelope with an intimate connection and breathe life into each note. We made 90 units of the Soundplane Model A. Currently we are working on a Model B, which will feature an improved mechanical design. We hope to have final prototypes late in 2018. Cost for the Model B is not yet determined. For updates about Model B availability and features, please sign up to our Soundplane News mailing list. Note: this is a different list from the main Madrona Labs list, just for Soundplane-related news! The playing surface, the high speed pressure sensor underneath it, and the high bandwidth DSP computer that analyzes the data are the end results of a three-year design process. There are no off-the-shelf sensor parts used—the sensing hardware was entirely developed in-house. As a result, nothing else feels like it. The Soundplane is made entirely in the USA. Its body is milled out of hardwood sustainably harvested in the USA, and made rigid with a black-anodized aluminum back. We assemble, tune and test the instruments by hand here in Seattle. All of the subassemblies and circuit boards are also made in the Seattle area. Local manufacturing throughout the process allows us to keep quality high and our transportation footprint low. 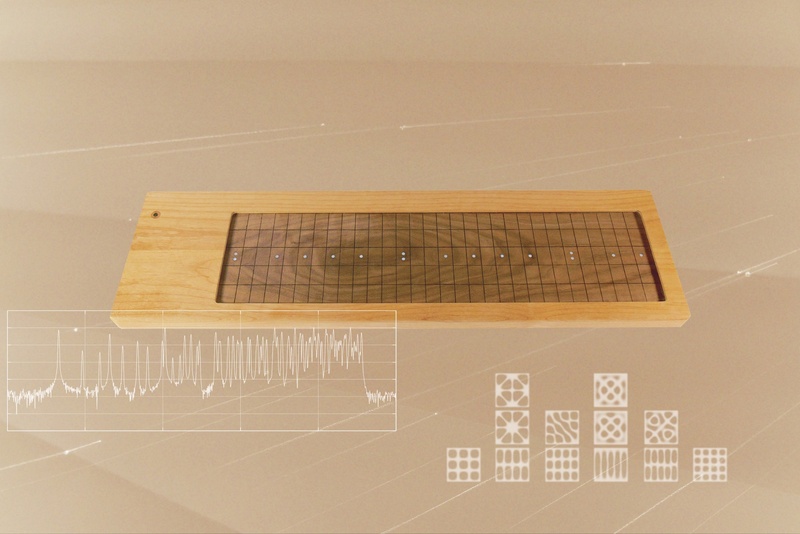 The Soundplane is a true force sensor. When you press on the articulated walnut playing surface, it bends slightly to your touch, and the small change in position is measured very accurately. This offers a playing experience with real physical feedback, and the feel of an instrument worth learning and spending time with. Our own experiences performing live have given us an obsession for simplicity. The Soundplane has no wall-wart adapter, no adapter at all, in fact. It's entirely powered by one USB cable. Plug that cable in, and you're done setting up. Forget the cable? It happens. That’s why we used the most common USB A->B cable that everyone seems to have extras of in a drawer somewhere. The Soundplane is very fast. It measures the pressure at each of 512 points on its surface almost 1000 times per second, enough to capture every nuance of a musical gesture. In comparison, the touch screens in tablet computers typically capture data at 30 to 60 frames per second. The Soundplane requires a computer running Mac OS, for now. Linux and Windows versions of the software are planned. With the Soundplane comes the Soundplane client application, which reads the raw pressure data over USB and converts it into customizable MIDI and OSC touch data. The surface can be configured as either a 150-note keyboard with position and pressure sensing on each key, or divided into an arbitrary number of zones. Other settings are available that provide fine control over the touch tracking and pressure response. The source code for the Soundplane client application is available under a permissive MIT license. This means that you are free to compile and use the software for any purposes, even commercial ones. Download it from github/madronalabs. Also included with the Soundplane is Aalto, our patchable modular software synthesizer. Aalto works with most controllers and software via MIDI, but when a Soundplane is connected it communicates directly over OSC, providing an easy-to-use, high-bandwidth connection from gesture to sound. We have worked with Symbolic Sound to make the Soundplane plug-and-play compatible with the Kyma system. For controlling analog synthesizers, we recommend Silent Way from Expert Sleepers, which has a built-in Soundplane module. And for everything that other software can’t do, we recommend Max/MSP/Jitter by Cycling ’74. How many simultaneous touches are possible? The software supports 16 touches. However the biggest limit to polyphony is how close together independent touches can be recognized, rather than how many touches there can be. Currently all simultaneous touches have to be more than approximately one inch apart from one another. This allows all ten fingers to play at once if they are spread out widely. How big is a Soundplane? About 1" by 8" by 28" (3 by 20 by 71 cm). Will it have MIDI / OSC outputs? The Soundplane A sends its data to the host computer via USB. Initially you will need a Macintosh computer to run our translator program, which generates MIDI and OSC data from the raw USB stream. You can send these messages out via a MIDI interface or, in the case of OSC, via Ethernet and other kinds of connections as well. We definitely understand the appeal of connecting the Soundplane directly to MIDI and CV/Gate devices without a computer in between, so a product that would allow that is definitely something we are thinking about. But, first things first. In the meantime, we recommend the use of a computer with CV generating software such as Silent Way from Expert Sleepers.